Need a visa to come to Canada? Are you looking for someone to guide you through the application process? Citizens of most countries who are not permanent residents of Canada require a visa to visit Canada even for a short time, as well as to transit (layover / change planes) inside Canada. If you fall into this category you must apply for a visa prior to your arrival in Canada or you will not be allowed to enter the country – this visa cannot be obtained upon arrival in Canada. If you are exempt from a visa, you still need an Electronic Travel Authorization (eTA). If you want to visit Canada on holiday, visit relatives, conduct business, or travel to Canada for any other reason you must apply for what is called a Temporary Resident Visa (TRV). This document is issued at the Canadian embassy nearest you and is placed in your passport before you travel. This visa shows the border officer that you have met the requirements to be a temporary resident of Canada as a visitor, student, or worker. If you have a criminal record or some other issue that may cause you to be inadmissible to Canada, you may need to apply for a Temporary Resident Permit (TRP) to enter Canada. Please note that you are not guaranteed entry into Canada even if you have been granted a visa – your entry into Canada is determined by the official at the port of entry. To discuss how you can get a visa to visit Canada, contact us for a consultation. We can determine whether or not you are eligible to apply for a visitor visa as well as advise you how you can prove you meet the requirements. Certain supporting documents are frequently used to demonstrate to the immigration officer that you should be granted a visa. Contact us for a consultation to assist you with a visitor visa application. If your temporary resident visa application will be submitted from outside Canada, the processing time for your visa application depends on the location of the office where you submit the application. Processing times can range between 3 to 140 days on average, depending upon location and time of year though many visa offices process their applications in under one month’s time. For a complete list of visa offices and processing times, please refer to the following table. Application timelines below are based on the processing time for a complete application. All timelines are averages and are subject to change without notice. There is no guarantee that your application will be processed within the average length of time as approval is at the officer’s discretion. If your application was submitted within Canada, the average processing time is 7-11 days. Our fees for temporary visitor visa applications are determined on a case-by-case basis, but Immigroup service fees usually range from around $750 for the simplest visitor visa application to around $2000 for extremely complicated matters. Top Priority service for clients who need to travel to Canada urgently carries additional costs. Please note that there is a minimum cancellation fee once work has begun on a file. If you do not know where you stand, whether you are eligible to enter Canada, or how to proceed contact us for assistance. Government application fees are subject to change at any time without notice and are not refundable from CIC regardless of whether or not the application is approved. Who Needs a Visa to Visit Canada? 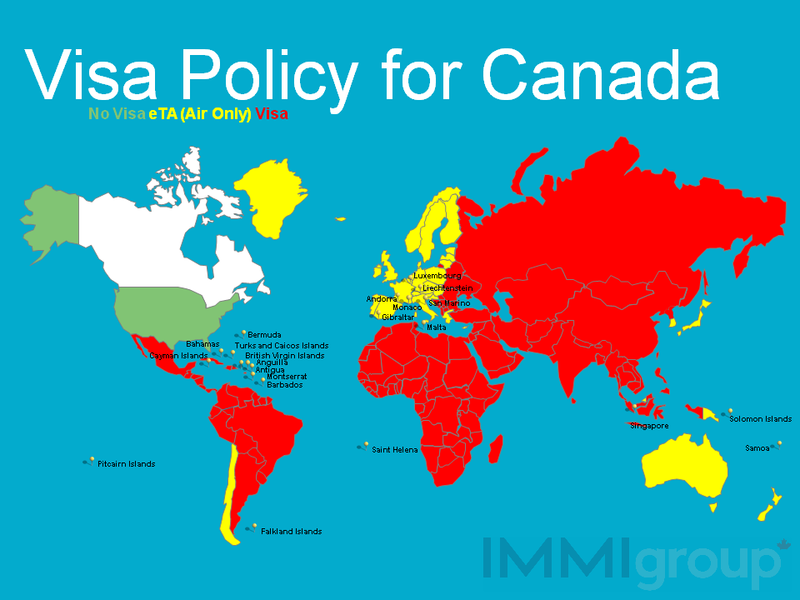 Citizens of most countries in the world need a visa to enter Canada. This includes citizens of many countries in Africa, Eastern Europe, Asia, the Caribbean, and South America. For a Complete list of countries whose citizens require a visa to enter or transit (change planes) in Canada, click here. Citizens of certain countries are not required to have a visa to enter Canada as a visitor. These countries include the United States, United Kingdom, Australia, many countries in Western Europe, Japan, and South Korea. For a complete list of countries whose citizens do not require a visa to enter Canada, click here. What are the basic requirements for a TRV (Temporary Resident Visa / Visitor Visa)? When visiting Canada, you must prove to the immigration officer that you do not intend to immigrate to Canada or stay in Canada permanently. You can be asked to provide any documentation pertaining to these and other requirements and you may be asked to complete a medical examination if necessary. When you speak with Immigroup regarding a Visitor Visa to Canada, we will advise you which of these requirements you most need to stress that you meet given your background and circumstances. We will also tell you of any additional requirements that apply to your situation. What are the requirements for Family Members? For a TRV (Visitor Visa) application, ‘family members’ means your spouse or common-law partner, your dependent children, and their dependent children (your grandchildren). ‘Spouse’ means your partner with whom you have entered into a legal marriage. ‘Common-law Partner’ means your partner with whom you have been living for at least one year. financially dependent since before 22 years old due to a medical condition. Any of your family members who wish to visit Canada must file separate applications for a Visitor Visa (each family member will receive their own visa). How long is a Visitor Visa valid? The length of time you can stay in Canada depends on the officer reviewing your visa application as well as the officer granting you entry to Canada when you arrive. Either officer could limit the time you may stay in Canada. A visitor visa could be granted for as long as 2 years or as little as 1 week, although you may only stay in Canada for up to 6 months at a time. If you do not require a visa to enter Canada, the border officer may still advise you that you may only stay for a certain amount of time such as 14 days. If they do not advise you of any length of time, you may stay for up to 6 months. Overstaying a visitor visa can cause serious problems for you if you want to apply for immigrant status or even enter Canada temporarily in the future. You can even have problems gaining entry to other countries, such as the United States. If you are not sure how long you can stay in Canada once your visa is granted or once you arrive, contact us for a consultation. We will help you determine the best way for you to move forward. In 2011 CIC stopped accepting parental sponsorship applications. However, CIC then began offering what’s called a Super Visa to people in this situation. So now parents or grandparents of Canadian citizens or permanent residents in Canada may be eligible to apply for a Super Visa. The super visa allows you to stay in Canada for up to 2 years. Even if you would not normally need a visa to visit Canada, you would still need to apply for the super visa if you wish to stay longer than the standard 6 month timeframe. Please note: Dependent children may not be included in an application for a super visa. How do I get a super visa? Proof that your child or grandchild can support you and their family while you are in Canada (Your child or grandchild must meet the what’s called the Low Income Cut Off – LICO); Proof of medical insurance. If you’re thinking of applying for a super visa, you can contact Immigroup for a consultation. We will help you determine your likelihood of success and we will detail the application procedure and types of evidence needed to support your case. What is the Low Income Cutt Off (LICO)? The LICO is the amount of money your child or grandchild needs to be making satisfy Citizenship and Immigration Canada that he or she can afford to support you (and your spouse) on a super visa. Unfortunately, the current income ammounts are not publicly available at this time. Contact Citizenship and Immigration Canada to find out the ammounts. What happens if I overstayed on my Visitor Visa? If you have stayed longer than the amount of time your visa was valid for, or that the length of time a border officer advised you that you may stay in Canada, this is an issue that could cause problems for your travel plans in the future. You could be denied entry to Canada if you try to come again in the future, or even denied entry to other countries, such as the United States. But, there is a solution. If you’ve overstayed your visa, it may be possible to restore your status and minimize any problems you may have. Contact us for a consultation to determine the best way to help you move forward. British Subjects - provided the passport notes the "Right of Abode"